VIZ Media Release "The Hello Kitty and Friends Coloring Book"
VIZ Media Announces "Hello Kitty & Friends Coloring Book"
VIZ Media Announces "Hello Kitty: Graphic Novel Box Set"
Perfect Square Announces "Hello Kitty: It's About Time"
VIZ Media's Perfect Square Has "Hello Kitty: Just Imagine"
VIZ Media-Perfect Square Presents "Hello Kitty: Delicious"
VIZ Media and Perfect Square Say "Hello Kitty: Here We Go!" 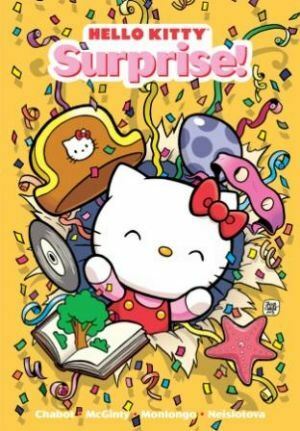 VIZ Media and ComicsPRO Team for "Hello Kitty"
VIZ Media, LLC (VIZ Media), the largest distributor and licensor of anime and manga in North America, takes readers on a whimsical new outing from its Perfect Square imprint with the world’s favorite pop culture icon and her adorable friends in the debut of HELLO KITTY: SURPRISE! on April 1st.